No need to heat up the kitchen (or the grill) for a good meal; just microwave cukes and onions for a chill soup. The photo doesn’t do justice to the chillin’ qualities of this fresh and cool cucumber dill soup. 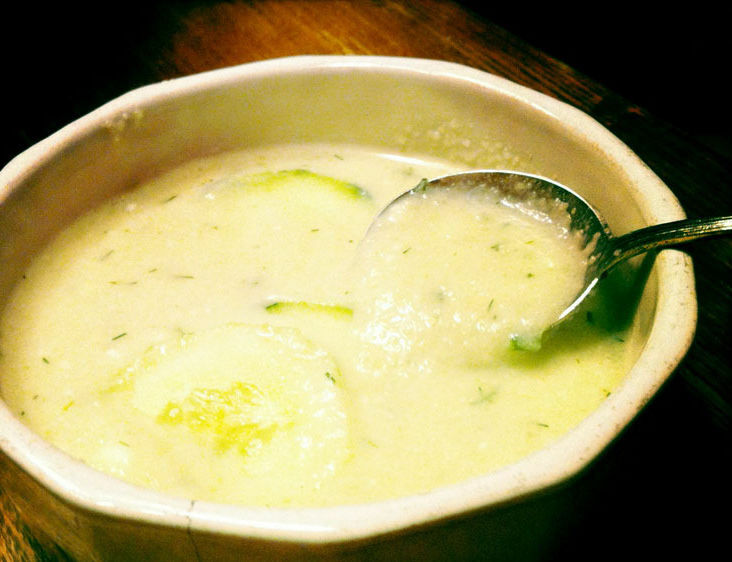 Chilled, dilled cucumber soup is the answer. The recipe comes from my relative’s well-worn Southern Living cookbook. She tells us Northwesterners, "I find it wonderfully refreshing on the sultry days of August when it’s too hot to heat up the kitchen, too hot to stand by the grill and I’ve got all these cucumbers from the garden coming in faster than anybody can eat in salads—and those intentions to make pickles are always greater than the energy required. I like to serve it with corn on the cob and some pimento cheese (homemade to use up those red peppers) on crackers." As tested in our highly scientific At Home kitchen, the soup is indeed a success. But even without the milk and yogurt (which one adds just before serving), the texture and flavor of the pureed cucumber, onion, dill and broth mixture was delicious. Or maybe the not-quite-finished version just tasted so good because I didn’t want to wait 3-4 hours for the soup to chill; we sped up the process by putting it in the freezer for about half an hour. The yogurt and milk do add richness and tang, but you could veganize the recipe easily by leaving them out (and replacing the chicken broth with vegetable broth, and butter with olive oil). All in all, though, a good way to chill with the cukes on a hot summer day, east or west coast. Place butter in a 3-quart casserole or bowl. Microwave at high 50 seconds, or until melted. Add chopped onion; microwave at high 2-2 1/2 minutes or until transparent. Stir in garlic powder and peeled, sliced cucumber. Cover with heavy-duty plastic wrap; microwave at high 7-8 minutes, stirring at 3-minute intervals. Stir cornstarch into broth; add to cucumber mixture. Cover and microwave at high 5 1/2-6 minutes or until slightly thickened. Pour into large bowl (if not in one already); stir in dillweed, and cool. Cover and chill 3-4 hours. Just before serving, stir in white pepper, milk and yogurt. Ladle into serving bowls; garnish if desired.